Caring for the environment is incredibly important and, as awareness of the many issues related to environmental protection is raised, more and more people are adapting their lifestyles accordingly. One way of improving the green credentials of a property is by installing solar panels, helping to reduce usage of energy from non-sustainable sources. Mitchell's Scaffolding Ltd were recently contracted to provide a scaffold solution to a private house, onto which solar panels were to be installed. As with every scaffold we create, it was essential to take all requirements into consideration. The weather is always a consideration but was of particular importance to this project, necessitating the use of extra caution to our working methods. Also essential to a successful result was allowing the homeowner full and unrestricted access to the property while the scaffold remained in place. The panels were to be installed to the central areas of the roof of the property. As part of our remit, the scaffold solution we provided had an access gate along with gin wheel: the latter was used to lift the heavy yet delicate solar panels up to the working platform. This was a short-term project, with the scaffold being dismantled within seven days of installation checks. We scheduled the dismantling date as soon as the booking date was confirmed, ensuring the least possible inconvenience to both the resident and neighbouring properties. Discover more of our work in the 'Portfolio' section of our website. The scaffolding solutions designed and delivered by Mitchell's allow crucial work to be carried out on a variety of buildings, many of which are essential parts of our country's infrastructure. One such building is Rochdale College, which recently required an extensive, bespoke scaffolding design. As the college was to remain open and fully-functional during the building work, a number of access issues had to be addressed. Safe and continuous access was required by students and faculty staff and so, as well as providing a platform for contractors to work from, we had to ensure that a people-friendly route to the main campus was provided. A temporary disabled access route was installed and this ramp was linked to the main entrance, after spanning a sunken service road. This element of the plan required the use of heavy-duty steel ladder beam, with the addition of handrails for safety. The structure was fully boarded out before plywood was added via smooth precession joints from the scaffold boards, negating any tripping hazard. Safety was further improved with the addition of a non-slip cover for pedestrians. The entrance foyer of the college required extensive beam work and so cradle support was erected above the entrance. This allowed work to begin on cutting away the existing handrail. Linking all of the various aspects together successfully required the most accurate workmanship with zero tolerance for deviation to the bespoke design. The college continued to operate as normal without impediment and the timescale was made appropriate to the needs of both college and contractor. To find out more about our scaffolding work, check out our portfolio. Want to be our next success story? Get in touch with our team! The diverse array of projects we provide scaffolding for present to us an equally diverse array of challenges for our expert team to overcome. One such challenge was at Pownall Bridge in Cheshire, where we had to create a temporary bridge across a stream to allow for repairs to be undertaken on the original permanent stone-built bridge. As well as supporting the weight of pedestrians, the temporary bridge would be used by passengers on horseback and so our design had to take this into account. Fortunately, there was good access to the site, allowing our vehicles to park much closer than was originally anticipated. Travellers were diverted to the temporary crossing using gravel tracks. To ensure a strong base, railway sleepers were installed at the foundations of the new bridge, while twin beams were used at each elevation over the water of the stream. One end of the platform was installed at a slight angle, allowing for a smooth transition between bridge level and gravel walkway. As the bridge neared completion, guards and handrails were put firmly into place. All of the fittings that were used on the walkway were then covered with protective caps, preventing any injuries to people or animals crossing the temporary bridge. Mitchell's Scaffolding Ltd specialise in creating such bespoke scaffolding structures. Our expert designers and scaffolders are fully-trained and certified, ensuring they deliver consistently safe and successful results. Find out more about our work on the website and get in touch to discuss YOUR bespoke scaffolding requirements. Progress sometimes involves looking back into the past and that was certainly the case with Blackburn Central Library, which was treated to a £2million facelift to restore it to its original glory. Mitchell's designed and installed a bespoke scaffolding solution to facilitate the 'Back to the Future' project. For 40 years, the building was home to the Co-Op Emporium, a department store that opened with the merger of four other Co-Op stores back in 1930. When the library took over the premises in 1970, an ill-advised project saw the facade of the building covered with ugly concrete cladding. As well as being aesthetically unattractive, the concrete cladding eroded over the years. This damage became so bad that there was a clear risk of lumps of masonry falling into the street below, prompting council bosses to authorise its removal. Mitchell's were contracted to provide a scaffolding solution, which was designed to bespoke specifications. Damian Talbot, who is in charge of leisure for Blackburn with Darwen council, said that he was 'delighted' with the removal of the concrete cladding that has allowed the original beauty of the building to shine through once again. He said, “The scaffolding that has been on the central library for around 12 months is almost completely removed, and the majority of the stonework has been restored. This was a vital piece of investment, and what it did was give us an opportunity to restore the building to its original glory. The library is very important in the town, very well used and one of the busiest libraries in the north west, and it is a landmark building in Blackburn centre. Work on the outside of the building coincided with a transformation inside, in which a brand-new online information hub was created to improve facilities for residents of the local area. All of the work is now complete and the scaffolding fully removed. To find out more about previous projects that Mitchell's have provided scaffolding to, check out our portfolio online. Our work takes us all over the country but two recent projects took place just a stone's throw away from our headquarters in Accrington. One project involved renovation work to almost 40 social housing properties while the other focused on new build properties. Both projects were located in the Oswaldtwistle area and Mitchell's successfully designed, installed and finally removed bespoke scaffolding to facilitate the crucial works. The project involved 39 social housing properties, each of which required new roofs along with pointing and render works. As the properties remained occupied during the works, the most important part of our brief was to ensure full protection to residents who could be potentially injured by falling debris or other objects. This complete protection was achieved with the use of double toe boards erected with each scaffold. To carry out the dual role of disposing waste from old roof coverings and delivering new slates to the roof, 2- and 3-lift gantries were installed, along with an additional scaffold gate which allows bumper hoists to be installed. The second project in Oswaldtwistle involved facilitating new builds, many of which were sold off-plan and all of which feature different design techniques. We provided a daily presence on-site to make sure that numerous adaptations could be undertaken on an ad hoc basis, preventing any downtime. Designed loading bays were erected for each individual property; larger properties warranted two loading bays. The scaffolding works were phased to meet the changing needs of the roofers and bricklayers, with installation for the pikes included. Both projects are now complete. For more information on the varied scaffolding services we provide, check out or website or get in touch with our team. Flooding affects properties all over the UK each year and many millions of pounds are spent in defense against the problem. Mitchell's Scaffolding Ltd were contracted to provide a scaffolding solution to a 70m stretch of Follyclough Brook in Rossendale, giving flood protection to a row of privately-owned houses. Follyclough Brook runs behind the row of houses. During periods of heavy rainfall, run-off from the brook has the potential to cause flooding and the protective wall already in place had fallen into disrepair. This wall was therefore condemned to be demolished and subsequently rebuilt. As soon as the design plans were agreed upon, Mitchell's Scaffolding created a scaffold design that would allow for access prior to and during the demolition and rebuild. The scaffolding was duly installed but then had to be quickly removed due to a downturn in the weather: this emergency removal was to prevent the the possibility of debris being trapped on the uprights and bracing standing in the bed. The scaffold was returned to place three days later and work began, with an estimated time of completion scheduled for 3-4 weeks later. Operatives from Mitchell's Scaffolding were on standby in case the weather turned bad again but further downpours were not as heavy as predicted and work was able to progress to completion, at which point the scaffolding was removed. Find out more about our bespoke scaffolding work on our website. Many of the projects we have supplied scaffolding services to have involved repair and renovation to buildings in which people live and work. Sometimes though, our work focuses on structures designed to deliver services and one of these is Aqueduct 35 in Colne, Lancashire. To reduce manual handling requirements, Mitchell's hired a quad and trailer which were used to transport scaffold equipment to the erection site. Specialist clothing was purchased in order to ensure that all operatives were fully equipped to carry out safe working practice. The project involved the planning and subsequent erection of three individual drop scaffolds, each of which was installed at a key point along the length of the aqueduct. These scaffold allowed the contractors to gain access to the areas within which the mains gas pipe and eroded concrete plinth are located. One of the key requirements of this unique project was to prevent any pressure whatsoever being placed on the walls of the viaduct; experts from Mitchell's Scaffolding Ltd therefore designed a system that incorporated a fixed amount of kentledges (a system of weights used to load-test piled foundations), allowing the scaffold to be constructed directly on the adjacent tow path. The entire process was overseen by officials from the National Grid, ensuring that all work was carried out according to strict regulations. After all necessary repairs were completed, our operatives removed the scaffolding, leaving the area clean and tidy. Residents of the Colne area can now look forward to a guaranteed supply of gas for many years to come. Check out the 'Portfolio' section of our website to find out more about the diverse scope of work carried out by Mitchell's Scaffolding Ltd. Improving the quality of housing stock is essential and it is to this end that the Local Authority Renewal Program was set up in Lancashire. Mitchell's Scaffolding Ltd have been involved with several projects carried out as part of this program, two of which were located in Huncoat and Great Harwood. The renovation works were carried out to a large number of properties, with operations centering on repair/replacement of chimneys and removal/render work. Mitchell's were awarded a rolling contract to supply scaffolding to the large-scale project, with around ten properties at a time having scaffold erected. As each property was completed, the scaffold was removed and re-erected at the following property. The scaffolding solutions we provided gave complete roofline access to bungalows and houses with two, three or four storeys. Many of the rendered properties had gables; these properties each required a pair of working lifts while the non-rendered properties needed a double handrail edge to prevent workers from falling. Added debris protection was provided with the addition of double toe-boards and gantry installation. All of the toe-boards and platforms were firmly clamped in place to prevent high winds from uplifting scaffold boards. A minimum of two staff members handled particularly long components to further enhance safety levels. Find out more about our past successes in the 'Portfolio' section of our website. Protection from fire is one of the most important aspects of Health & Safety in the workplace and many buildings use a sprinkler system as a first line of defence. When a busy food production factory decide to install such a system, suspended scaffolding was required and Mitchell's were ideally place to provide it. The Two Sisters Food Group is based in Scunthorpe and comprises a large warehouse along with administration and maintenance areas. As part of a larger refurbishment project, the installation of the sprinkler system was the most major aspect: work was scheduled to take place in two phases. The positioning of the scaffold structures, along with the massive scale of the project, meant that aluminium tubing was the best option. In the first phase, scaffold and loading were erected around a busy forklift doorway, ensuring that full operational access was maintained. The vast amount of scaffolding tubing was manually lifted; access was permitted through a specifically-created opening, allowing the scaffold kit to pass freely into the building's roof space. Before any assembly could be undertaken, the scaffolding operatives began to transfer equipment to the required area, a considerable distance equivalent to around three full-sized football pitches. Towards the end of the phase, many smaller areas such as the boiler room required additional walkways, which Mitchell's were immediately able to provide. 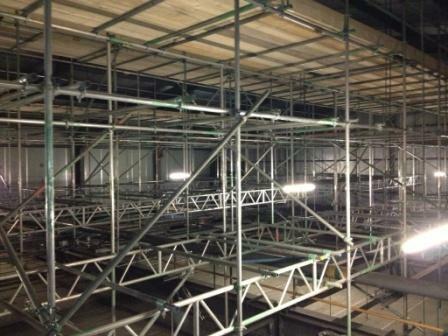 Once the work was completed, we dismantled and removed all scaffolding, leaving the premises clean, safe and secure. Find out more about our work on our website and get in touch with us to discuss your bespoke scaffolding requirements. Mitchell's Scaffolding work in both the private and public sectors, facilitating construction, renovation and refurbishment works. We often have to work as quickly as possible while ensuring safety levels are constantly at 100%; here we look at two very different projects that had to be completed in a limited time to prevent major disruption to the public. 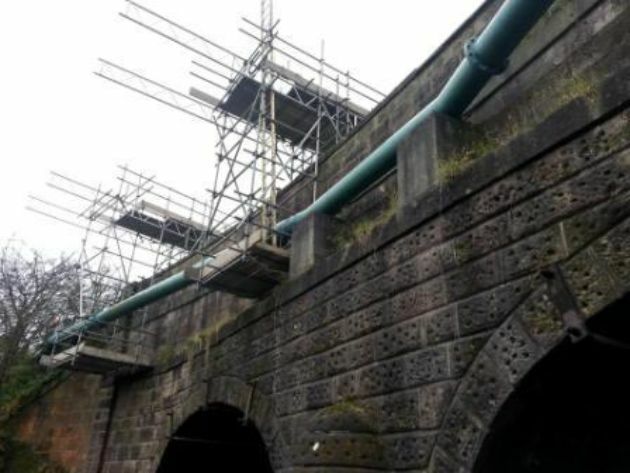 To ensure the minimum of disruption to this crucial water treatment plant, the scaffold works required were planned well in advance, with all possibilities being closely considered. This pre-start planning was certainly valuable as vehicle access was an issue due to the need to park so close to the erection point on the access road; proper planning meant that everything from parking induction to scaffold erection took place without issue. Several components went into making this project run smoothly. The scaffold allowed access to the flue and pipe works while a gated tower was installed to provide easy access to the low-level flat roof. Safety was ensured with a two-sided, hand-railed walkway installed across the structure and the perimeter of the building adjacent. We designed and installed a full scaffold structure to protect patrons passing through the foyer of this busy station while building work took place. Sheeted and ply-boarded, the huge crash deck was designed to ensure complete protection to the entire pedestrian area, preventing any debris from falling through and causing injury. To further enhance pedestrian safety, the scaffolding work took place during the night from 11pm until 5am while the station was closed to the public. This diverse pair of projects highlights the versatility of scaffolding provided by Mitchell's. Discover more of our work on the website and get in touch with us to discuss your bespoke scaffolding requirements. Mitchell's Scaffolding often design, supply, build and subsequently remove scaffolds designed to facilitate new build projects. One such project we completed involved creating a complex bespoke scaffold for a brand new social housing project in Chorley. The new semi-detached houses, two to a plot across a total of three plots, are made using a timber frame construction method. Unlike traditional new builds, where scaffolding is erected in phases to accommodate bricklayers, for timber-frame builds the scaffold must be erected in a single phase. We always carry out detailed inspections and pre-start meetings to ensure that the scaffolding solution we design is nothing less than perfect. One key point discussed during pre-start meetings for this particular project was the close proximity of the site to railway tracks: it was essential to address additional requirements that would ensure train services were not impeded. Brick guards and additional fencing were agreed on to prevent the possibility of crossing any boundaries. Work began on the first plot, with four sides up to roof height. Improved access at each scaffold level was provided with staircases and second and third scaffolds were installed as soon as the first was completed. Our scaffolds included small link bridges, which were used to allow ease of movement for contractors between plots, ensuring that injury risk was reduced and efficiency enhanced. The installation of loading bays followed before internal scaffolds were set up to allow for party walls to be completed. Once this had taken place and after some alterations to roofing and checking for water-tightness, all scaffolds were removed and the job was complete. Find out more about projects facilitated by Mitchell's Scaffolding in the 'Portfolio' section of our website. Nando's is one of the most popular fast food chains on the high street, with more than 1,000 branches around the world. Over 280 of those branches are located in the UK and Northern Ireland: Mitchell's Scaffolding recently designed and installed bespoke scaffolding at one of these branches. Nando's was founded in South Africa in 1987, after friends Fernando Duarte and Robert Brozin went for a meal together at a local takeaway named 'Chickenland'. So impressive was the food that the friends decided to purchase the outlet, paying the equivalent of around £25,000. After renaming the restaurant 'Nando's' (after Fernando's son), the business quickly grew, with three further outlets opening within two years. The first Nando's in the UK opened in 1992 and, after an initial struggle, became the fast food giant that it is today, employing more than 8,000 UK staff. The branch of Nando's in Cheetham Hill, Manchester, is located in the busy Fort Street Retail Park. When a substantial amount of renovation and repair work was planned to the outside of the building, the owners contacted Mitchell's Scaffolding to request scaffolding to provide safe, secure and easy access to various areas of the structure. The scaffolding was quickly erected, allowing work to progress quickly. Minimal disruption was caused to customers of the Nando's and adjacent areas within the retail park. Once the work was completed, we reversed the process and removed all trace of the scaffold. How can we facilitate YOUR project with our scaffolding services? Get in touch and let us know. The scope of work carried out by Mitchell's Scaffolding Ltd is truly diverse, covering the widest range of building types imaginable from old, listed structures to brand new building projects. Here we look at a unique project we completed. The Yorkshire Bank building is located on Manchester Road in Burnley, where it stands on a busy corner. When upper-level window decoration work was planned, the owners contacted Mitchell's Scaffolding Ltd to provide a comprehensive scaffolding solution to provide safe access. The time allotted for the project, a single Sunday, meant that we had to work quickly to meet targets. This short working time ensured minimum disruption to passing traffic and allowed the bank to offer completely uninterrupted service to its customers. The installation of the scaffolding was designed to allow window decoration and replacement to take place quickly and safely. A licence and scaffold permit were obtained through Lancashire Highways due to the unique positioning of the structure. The scaffolding structure we designed included three fully-boarded lifts at the base to allow rapid, unobstructed access to the building. There was a danger of escaping debris causing injury to passing pedestrians and so debris nets were installed to prevent this from occurring. A final safeguard was provided in the form of a fan, which was run in to the full perimeter at the lowest point. Ladder access was built at each level and ladder traps installed. To ensure complete stability, the whole scaffolding structure was firmly tied to the building. Find out more about our past projects in the 'Portfolio' section of our website and get in touch with our skilled technical team for further information on our scaffolding services. At Mitchell's Scaffolding Ltd, safety is our number-one priority. That's why we insist that all of our operatives hold an up-to-date CSCS (Construction Skills Certificate Scheme) or CISRS (Construction Industry Scaffolders Record Scheme) card. As the industry-leading scaffold training scheme for more than 40 years, the CISRS is the 'preferred scaffolding qualification of all the major organisations including CSCS, NASC, HSE, Build UK, UNITE and the largest scaffold systems manufacturers'. There are in excess of 60,000 CISRS cardholders in the UK, with a further 5,000 holders overseas. The CSCS delivers training and qualifications across the construction industry. Once trained and qualified, course attendees are issued with a card that shows they are competent to carry out the relevant work in a safe, informed and effective manner. It is used to prove skills to a potential employee such as Mitchell's Scaffolding Ltd, who can then guarantee that safety is always of the most crucial importance. Though possessing a valid CSCS card is not currently a legal requirement in the UK, Mitchell's Scaffolding insist that all of our operatives carry one. We need to be certain that our operatives are fully competent in their work, allowing us to maintain our impressive record of unmatched safety levels in our varying workplaces. We are always seeking to extend our workforce with intelligent, focused and dedicated operatives. For more information about working with us, check out our 'Careers' page and get in touch with our team. 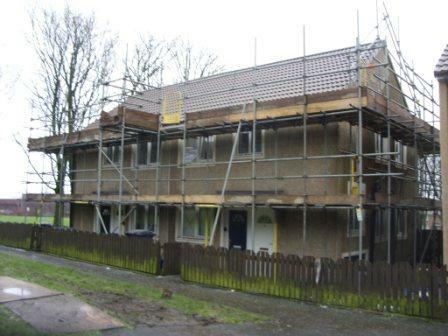 Mitchell's Scaffolding Ltd are often involved with work on housing contracts, delivering our signature collection of scaffolding services to facilitate new-build as well as renovation work. Below are details of one such contract that we have successfully carried out. Browsholme is a large estate adjacent to Turf Moor, the home of Burnley Football Club. The estate comprises a mixture of houses and flats, many of which required major refurbishment work. 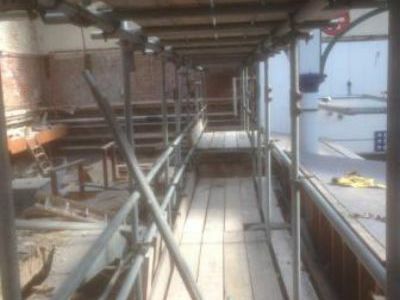 To allow the various joiners, builders and engineers to gain safe, easy access to relevant areas, Mitchell's Scaffolding Ltd were called upon to provide a professional scaffolding solution. The project was a challenging one, with issues such as narrow/restricted access, parking limitations, time constraints and the need to disturb residents as little as possible. Working closely with site and contract management ensured that we were able to get around the many issues, solving problems as we went. All of the scaffolds we provided were equipped with full elevation brick guards on each working platform, along with handrails on every step. Where render works required, internal handrails were also provided. The ladder access presented a security issue and so was fully secured at the end of each working day. Discover more of our works in the 'Portfolio' section of our website! Though Mitchell's Scaffolding Ltd are involved with construction, renovation and restoration projects all over the UK, we are never happier than when we are working right here in Lancashire, improving our local area. As well as delivering scaffolding solutions in domestic and industrial situations, we have also been involved with many municipal projects, from hospitals and schools to churches, town halls and even an aqueduct! One of the municipal projects we have been proud to work on was at Blackburn Central Library. 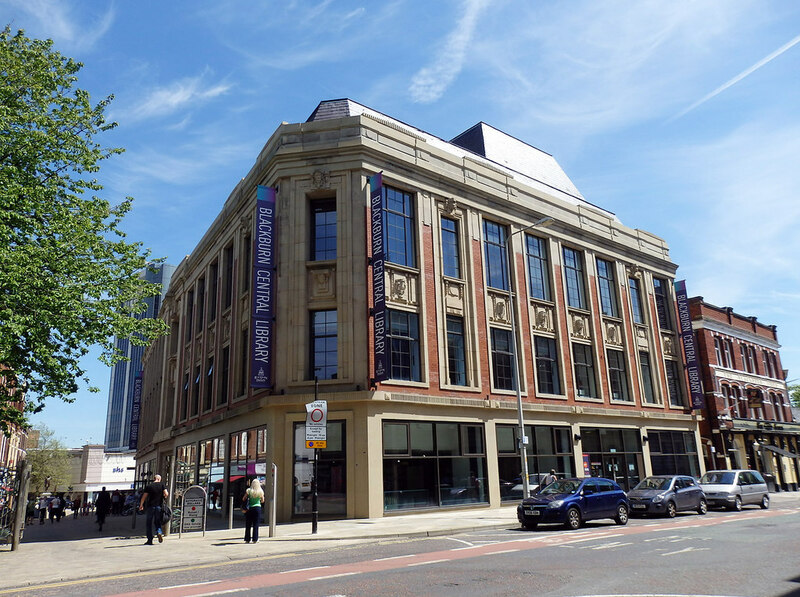 The dual-phase project, with a budget of £2m, was designed to remove damaged cladding before restoring the original 1920s facade of the building. Mitchell's Scaffolding Ltd kicked off the project by providing a sturdy scaffold to permit safe removal of the link bridge connecting the library with King George's Hall. As the bridge was gradually removed, we extended our scaffold to allow building repair work to begin, using separate towers to link each platform level. Phase two of the project involved erecting a large 7-lift scaffold that ran the entire length of Town Hall Street. The working space was particularly restricted, necessitating a bespoke plan to enable beamed elevations to be run in. Monarflex sheeting was used to enclose the entire elevation, projecting adjacent properties. Discover more of our past projects in the 'Portfolio' section of our website. Happy New Year from Mitchell's! It's hard to believe that another year has gone by yet here we are right on the cusp of 2019. We would like to wish a happy new year to all of our clients and say a big thank you for your custom over the past year. Here's to many more! 2018 has been a pretty crazy year in terms of the weather but construction and renovation work must continue regardless. That has meant that all of the staff here at Mitchell's Scaffolding Ltd have been kept busy designing and implementing bespoke scaffolding and site access projects. The early months of the year are one of our busiest times here at Mitchell's Scaffolding Ltd and we expect 2019 to be no exception. Make sure you stay in touch with what we're up to all year round by joining us on social media and subscribing to our monthly, feature-packed newsletter. Once again, we wish you and your loved ones a very happy, prosperous and constructive 2019. 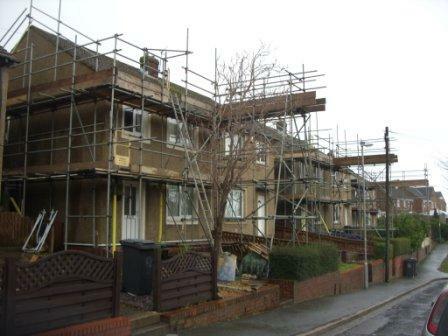 Mitchell's Scaffolding Ltd offer a wide and diverse variety of scaffolding services. This means that an equally wide and diverse variety of projects are completed with our help; from hospitals to learning establishments and everything in between, we can design and supply the most effective scaffolding solutions tailored to individual specifications. Over a period of several years, the facade of Wesham Hospital building has suffered from slight movement issues. To prevent any further movement and render the building safe for use, a shoring-up remedial project was proposed which necessitated the erection of scaffolding. Mitchell's Scaffolding Ltd designed and delivered a complete scaffolding solution for the project. As the structure was required to stand for more than 12 months, a particularly substantial design was required. 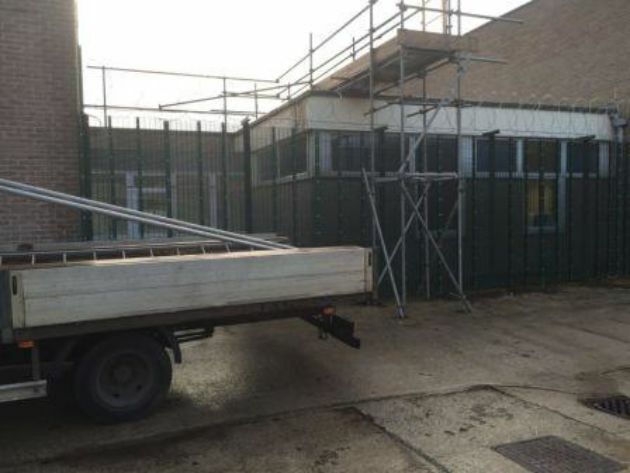 Scaffold inspections take place every week to ensure everything is in order and fencing has been erected around the site to prevent unauthorised access. Extensive repointing work was required to the facade and chimney stack of St Mary's College, necessitating scaffolding which was constructed in three phases. The college is located in a residential area and so hoarding to the full base on both elevations was quickly put in place, along with effective debris netting. A gated entry point offers secure access, negating the need for constant removal and reattachment of the fixings. Wherever the building and whatever the project, Mitchell's Scaffolding Ltd have got the right solution. Browse our portfolio to see more examples of the diverse work we do and get in touch with our team for information and advice. The winter does not provide favourable weather conditions for construction and renovation work though of course many projects are essential and must continue regardless. For the benefit of such projects, Mitchell's Scaffolding Ltd delivers a professional collection of solutions, one of which is temporary roofs. Much of the UK has been subject to heavy rain in recent days, preventing many sites from being able to function and thus preventing build target times from being met. These overruns and the standing time are costly; all of the problems can be successfully avoided with weather protection in the form of a temporary roof from Mitchell's Scaffolding Ltd. Whether a single roof or a complete building and wherever the location, we can create the perfect temporary roof design for any project. We utilise the most modern, effective roofing systems to ensure the ideal solution that will provide proper protection, containment or a combination of both. No matter whether the roof is of any shape from pitched to polygonal, Mitchell's Scaffolding Ltd guarantee a professional result every time. Health and Safety is of course of great importance to us here at Mitchell's Scaffolding Ltd. That's why we ensure and guarantee that all of our scaffolders are fully trained to always adhere to the latest health and safety regulations and that they carry official, up to date CSCS cards. For more information about how a temporary roof could let YOUR project continue this winter, get in touch with our team today. The high winds in the Accrington and surrounding areas have driven a lot of inquires our way in the last week, with new contracts starting on Monday when questions raised over safety in high winds have been asked we always state the Clamping down of scaffold boards has always been part of our day to day working, keeping our operatives and the contractors who utilize the scaffolds safe is our top priority. Blackburn's former public house The Cellar bar is receiving a full on face lift . Mitchell's have installed a fully boarded scaffold to accommodate all the regeneration works. No matter what the project scaffold, may surprise you. When access out of a temporary building was required, the solution was put in place in the format of a stair tread and scaffold. Got the go-ahead and underway in March of this year this contract is set to run for up to 4 years with a steady turnaround of scaffold following completion of each property. Work on the Tenanted Estate adjacent to Burnley Football clubs hallowed ground Turf Moor is now well underway as the next stage of property improvement continues. Following last Wednesdays slaughter Mitchell's redeemed ourselves with a victory at Blackburn's DW Soccer Dome. No substitutions were made at all during the game and Antony our goal keeper made a fantastic save stopping a hard hit penalty. We have grown the fleet to 9 vehicles including our latest 21 Tonne wagon. When planning for the company growth, Director Stuart put himself through his HGV driving test along with 2 of our scaffolder drivers We have also made provision for a 4th member of our team to take his test in June 2015. Mitchell's have been installing the scaffolding to access the roof area in the main Foyer a fully designed crash deck to enable pedestrians safe access below the works being undertaken, as part of Blackburn Town Centre Renewal. As Seen in the Lancashire Telegraph Friday 3rd of October. A total of 39 houses have undergone a mixture of Roofing works pointing and render to see this small estate in Oswaldtwistle . you will be reporting to the Mitchell's Accrington Yard. Our guys are working in Little-borough OL15 and in Waddington getting scaffold up for home owners to undertake pointing on his cottage lets hope the weather holds off also we are Busy getting the the 6th lift down at Blackburn Library, then striking in Accrington on the hospital, Lime Road, Whalley road on to Rishton. Accrington's Victoria Hospital, is having a scaffold erected on another section of the old building for roof and pointing with all lifts fully boarded. The final scaffold element removed from St Pauls Church On Plantation Street. installation of new fascias and soffits. While Loughclough will see a detached home fully encased in scaffold for its new barge-boards. But Leicester road in Blackburn is bucking this trend having scaffold for solar panel maintenance. The Aspinall arms out at Mitton near Whalley has had all the scaffold removed unavailing the new and very polished exterior this tastefully renovated public house will be ready to welcome new customers within the month, the new owners have invested on both the internal and external aspects of the property as a result The Aspinall Arms once again stands proud in its rural setting. The new build house in Wiswell also saw a large portion of scaffold removed and altered to accommodate the rendering to the back and gable of the property and the front where the new driveway and landscaping are due to start . Mitchell's men also struck the scaffold to the Factory on Weir street where the scaffold had been erected for the roofing works, the site ran along the side the culvert carrying the river Blake-water, making the transportation of equipment a somewhat difficult task. Mitchell's Latest operative Dylan has undertaken his Part one scaffolder Training Course at Blackburn's Training 2000. The two week course is now awaiting his work based evidence submission to finalize his qualification. Having worked with Mitchell's on and off from leaving school this training has sealed his position giving him the polished edge to the skills he has previously gained. Stuart Mitchell Managing Director said that Training was a vital part of the scaffold industry, and when asking Dylan" what aspect of the training did you learn from the most" Dylan said "the load weights of scaffold fittings and the importance of why scaffolds are erected specifically with the load capacity for the job"
Stuart was very pleased to hear Dylan had gained a genuine understanding from his training and has set the ball rolling for a second operative to undertake his part 1 in May this year. 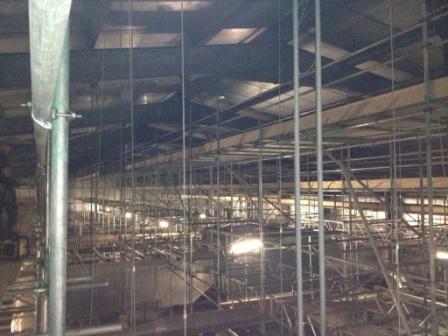 Our guys are now over halfway through the erecting and stripping scaffold on the Ingol Estate in Preston. The scaffold is being installed as edge protection while the main contractors replace the all the old and worn railings from the flats. This is quite a fast paced job calling for excellent co-ordination with site agent, installers and Mitchell's. The expectation is that the staircase balustrades will be arriving on site any day now with and end date to clear site in a little over 1 week meaning the site is running to schedule. More work with contractors like this always be welcome. Delays in the manufacture of the balustrades had a knock on effect, seeing the 5 remaining scaffolds having to remain on site until the last batch arrived for the contractors to install. Mitchell's scaffolders and trainees have been having a spring order session for; new spanners, belts, bubbles and alike. The advanced scaffolders have opted for Aircraft Alloy handles and in some cases they've coloured handles. Heavy duty frogs have been another one of the main orders, we have also had a couple of full belts put through, so all the guys are fully kitted out once again. The new tools were ordered over the past few weeks with the last batch arriving this morning. The Aspinall Arms public house is nearing the end of it's extensive re-refurbishment with the chimney scaffold being removed, work above and around the smoking shelter completed allowing for this section of the scaffold to be removed and a few alterations on the remaining scaffold to be undertaken to allow for the last few areas to have the finishing touches. The Phased work to a New Build Detached house in Wiswell will see another section of scaffold struck and alterations made "accommodating the different trades on site"
Clayton is to see the table lifts added to progressive work on a detached house extension. In Nelson, Neighbours to a property that has had roofing works undertaken utilising Mitchell's Scaffolding, are to have their house front and roof works undertaken by the same contractor, so as one scaffold comes down we will be be re-erecting the house next door, reducing carbon emissions and travel. Then on to Shippley where Cavity wall insulation was installed, 2 of the elevations had areas in need of access, 1 side of the property had a large glass roofed conservatory and an adjoining porch to span and the 2nd an attached garage. Jordan Birtwell came to work with Mitchell's scaffolding for his school work experience as a 15year old in 2009 Stuart Mitchell spotted his potential. He is now collating his work based evidence in readiness for under-taking his scaffolding part 1 qualification expected to be in April of this year. Having worked on some very demanding projects we are confident that he will be successful. Mitchell's began work on Wednesday 19th Feb erecting scaffold for roofing works as part of the Hyndburn homes repair scheme . The second block is all but finished, we are working with the main contractor to ensure all works are running to schedule. Mitchell's started to remove the first section of scaffold revealing the original façade of this magnificent building. Having a tantalizing glimpse of what's to come adds to the overall anticipation. The new look is restricted to one section at present, an extensive section of the Northgate elevation scaffold is to remain which will be linked to the next phase set to run the length of Town Hall Street elevation. Unfortunately the cabins that we went to look at in Leeds were in a poor state and not suitable for our much needed office space. Stuart Mitchell MD has taken the decision to construct his own.Over crowding in the Office has become a priority and the need for additional room is top of the list. 1) Fork lift Hired in to begin moving the scaffold equipment. 3) The scaffolder's will get an area of their own with full exclusive canteen facility's, Drying Room Fridge Microwave and the all important Brewing Facilities. 4) Stuart Mitchell is going to get a proper private office space where he can host meetings and meet with clients without the constant interruption. 5) And the ladies of the company will get the space to undertake their work. Today's jaunt on the trail of a new portacabin saw the MD in Leeds looking at 2 cabins sad to say they had seen better days. the transport would have seen the rendered wood disintegrate. The decision has now been made rather than expand upwards with a cabin a top of our existing cabin , we are going to extend what we have. Now the qualification affords Mick the opportunity to go forward, honing the scaffolding skill's. Stuart Mitchell said " to have so much experience without the paper qualification is a shear waste of talent, Michael is now able to sign off the work he has been capable of doing for many years"
Mitchell's took home a Highly commended at this years Awards for their commitment to health and safety. a Total of 14 entrants were vying for this very coveted award. Our membership gives us all the latest information and provides Mitchell's Scaffolding with the opertunity to interact with other trades within the built envionment through attendance of the monthly meetings, with the oppertunity to discuss and raise questions in regard to issues that affect everyone. Scott Mitchell is now undertaking his advanced Scaffolder training at Training 2000 in Blackburn. this is the latest scaffolding training in our annual training plan. Both Wesley Mcivor and Antony Clayton have already completing their part 2 scaffolder training courses and are now fully accredited Part 2 Scaffolders in January of this year. Mitchell's put ourselves forward for this CAPITA run health and safety accreditation in conjunction with our Construction line renewal. The process covers every aspect of the work we undertake covering everything from ladder,and equipment inspections PPE issue and maintainance, recording of information, toolbox talks to name but a few. Wes McIvor is set to complete his part 2 Scaffolder Training after a 2 year break this is being undertake at Training 2000 Wes had left the trade after taking his part one. While Stuart Mitchell MD is in the final 6 months of his Construction HND at Blackburn College. Mitchell's have been awarded our renewal of CHAS accreditation on New Years Day 2013. Mitchell's have always opted for accreditation with CHAS since applying in 2006. To be accredited rather than just registered with CHAS Mitchell's had to undertake the annual reviews. This year however saw changes in the CHAS format now there is no longer a 2 tier approach and all applicants are required to under go the annual review process and therefore cut out the confusion from a buyers prospective. Bringing this accreditation in line with other similar SSIP's. In The run up to Christmas Mitchell's had our Safecontractor accreditation awarded. This accreditation has been maintained for over 6 years with our first application Following the arrival of our then newest recruit Karen Turner who took onboard the organising of information and ensuring the company clearly demonstrated the very best of working Practices. Stuart MD said “Steve’s hard work has paid off with the on-site assessment to come and finalisation of his work based evidence Steve is well on the way to the final carded qualification so well done"
Our latest Training schedule is now well under way with Stephan Bracewell scaffolder with Mitchell's for over 4 years has been booked to take his Advanced Scaffolder NVQ level 3 Qualification in April of this year through our local training provider Training 2000 Blackburn. Stuart Mitchell MD said " Steve has shown his commitment to the company on many occasions, the time is now right to fully advance him to the next level, providing this training will not only give Steve the training he is suited to it will further show Mitchell's Commitment to improving our workforce when potential clients look for all round quality in a company"
The Northwest Regional Construction Awards saw the cream of Northwest Companies vying for the accolades in the ten categories in this years Awards. Mitchell’s had made it through in not 1 but 2 categories Leadership & People Development and the SME of the Year Award. Though Mitchell's didn’t take the crown Mitchell’s Managing Director Stuart Mitchell said “ just to make it through to the finals in this category says a lot about my company, the training and working practices we employ makes a big difference to the standard of work we provide, it’s great honour to get this far and the recognition especially given the calibre of entrants is great, I would personally like to congratulate The Cruden Group on their success. Integration & Collaborative Working Award – Value in Construction, Sustainability Award – Our Legacy, Business Innovation Award, Heritage Award, Contractor of the Year Award, SME of the Year Award, Client of the Year Award, Young Achiever of the Year Award, Project of the Year Award, Local Economic Award . Though Mitchell's didn’t claim the Small to Medium Enterprise category the spotlight fell on them when they were selected as one of only 5 companies out of the 45 in attendance to be presented with a “Highly commended” for the way in which our business processes, people development, collaborative working and finding new ways of working underpin the company. Entertainment from: live band, Piper, Quiz and Last Night of the Proms tickets are priced at just £10 a head for this celebrationand are available from Phil Copeland. HMP Preston on 07731 617 092.
with a 3 course meal and bar til 1pm. Entertainment from Soul Diva Louise with disco till late. Mitchell’s have made it to this years finals of the North West Regional Construction Awards. Stuart Mitchell said “this is fantastic news , reaching the final in not one but two categories is even better, we have been shortlisted for The Leadership and people Development Award as well as The SME of the Year Award, I know how coveted the awards are." "I am absolutely delighted to have made it this far and send my congratulations to all this years finalists, for making it to this stage. I look forward to meeting them at the Ceremony on the 31st of May." Mitchell's have supplied and erected the scaffolding requirements for the open air rock festival held annually in Gisburn. The massive graffiti wall is accessed from staircases leading to the staging platform where members of the audience add their own art. The work is undertaken in the run up to the festival antd removed following the last night. This local and ever growing open air event is a fantastic event for all age groups and well worth a visit. Having now completed the contract for solar panel installation on 82 Property’s in the Blackburn ,Darwen and Preston area. Started Pre Christmas. Call 01254 392100 and begin working with us. Mitchell's take home Highly commended in the Team of the year award,MD Stuart Mitchell says" although we lost out to a grat company in Thwaites Brewary regardless of the outcome the Team at Mitchell's Scaffolding are the best and I am very proud of their achivement." Once again Mitchells scaffolding in lancashire rose to the occasion at a local charity event organised by Oakleigh Dental Centre in Oswaldtwistle. The event took place at the newly refurbished Trickys public house on Thwaites Road. Mitchell’s sponsored the event providing a wagon for decoration with bunting and banners to promote the event. Providing the sacks for racing and on the ground support throughout the night with the scaffolders in burnley and blackburn manning the various tombola’s and stalls. The night was a great success with over £600 raised, egg and spoon, sack and three legged races aimed at adults and children all added to the fun. As ever the competitive nature of scaffolders came to the fore as the staff vied for first place in all the racing. The extensive scaffolding requirements at the main entrance to Rochdale College posed a numbers of access issue. The objective to ensure safe and continuous access for college students and members of the faculty. The finished scaffold has created a safe and people freindly rout too the main campus and allows the main contractor a safe platform to work on. Create a temporary disabled access. Erect cradle support above entrance. Link disabled ramp to access the entrance spanning the sunken service road. All aspects of the work undertaken allowed the college to operate with minimum disruption during this very busy time. Working very closely with the main contractor Mitchell's ensured that the time scale was appropriate to both the college and contractor needs. Extensive beam work spanning the entrance foyer and patioed areas had to be put in place forming a cradle over the entrance before work could begin cutting away the existing handrail. The spanning of the service road required the use heavy duty steel ladder beam, additional handrails, the structure to be boarded out prior to the addition of Ply wood, removing any potential trip hazard and finaly a none slip cover is to be added for pedestrians. Once complete the link had to be made from the temporary wheelchair / disabled ramp. The linking of all 3 aspects called for accurate workmanship with no tollerance for any deviation to the design. The overall covering required smooth precession joints from the scaffold boards to allow plywood facing to be laid prior to the anti slip top covering being laid. Mitchells Scaffolding win second place by dressing up their scaffold wagon as Blackpool Lancashire theme for the Accrington Lions Community Carnival Procession 2011. The Essence of Blackpool theme included characters from the traditional Blackpool of yester-year with Punch (Steve Bracewell Supervisor) Judy (Sharon Turner Chief Executive Officer), The Circus Ring Master ( Neil Heap Supervisor), The Traditional English Holiday Maker (Mark Palmer Supervisor) The House of Horrors Freddie Cruger (Stuart Mitchell MD) Stag Night Morph man (Marcus Hargreaves Family Friend) Blackpool Donkey ( Laura Hargreaves Family Friend) The Old-fashioned Strong Man( Karen Turner Business Development Executive) The Laughing Clown (Darren Hargreaves Former Employee) Mystic Gypsy Rose lee (Joanne Hargreaves Family Fried) and all the children as Pirates, Candy Floss , Alice in Wonderland, The White Rabbit, Playing Cards, Pasaje Del Terror, Hen Night Girls. Our scaffolders erected blackpool tower out of our scaffolding tubes. This took a lot of effort with the MD Stuart and his staff working until midnight on the 17th and in again at 6 am the following morning to get the float ready but the effort was worth it, with a great mix of people and characters a fun day was had by all and the winning of second prize was the icing on the cake. Young Uns Award 2011 - Stuart Mitchell has been awarded winner of the Young Business Person of the Year 2011. Stuart Was also shortlisted for the one to watch 2011 award. After a few close calls Stuart has walked away with the top Accolade Young Business Person of the year. The competition was hard fought with excellent entry’s from some extremely good young business men from across the Lancashire Region. Stuart wants to Congratulate all the winners of the various categories and those who came so close. On behalf of the University of Central Lancashire and Lancashire Business View! After a Champagne Reception the award for SME of the year deservedly went to Rochdale based Jackson, Jackson & Sons. Following the announcement Stuart said that although it was disappointing not to have won, he was pleased to see the award go to such a impressive competitor. Mitchell's Have made the Regional finals for The North West Construction award against very stong competition . Managing Director Stuart Mitchell said ," we understand all the entrants have put forward very strong applications and are worthy contenders", " I am very proud to have made it this far and send my congratulations to all the entrants on reaching this stage. The Maddison Allen appeal supported by Mitchell's Scaffolding Ltd held a Sportsman's Dinner at Blackburns Ewood Park. Neil Razor Ruddock was the guest speaker for the evening and entertained the guests with tales from his footballing career. Razor was seated with Mitchell's Scaffolding staff and friends. following his entertaining speach Razor sat and joked with Stuart who gave every bit as good as he got. Raffel Tickets Prizes and clothes donated by Coronation Street stars raised more than £2,000 for The Madison Allan Appeal on 9th October 2010. Mitchells Scaffolding workers, helped out providing security in the shape of black tie and tuxedo-clad, they also helped out selling raffel tickets raising money at the event. Actress Shobna Gulati, who plays Sunita Alahan in the ITV soap, collected dresses, tops and accessories from fellow Corrie cast members and sold them at a stall in Darwen Market. Madison, six, of Lord’s Crescent, Lower Darwen, needs money to pay for treatment outside the UK for her rare form of cancer, neuroblastoma. An appeal to pay for last-chance treatment has so far raised £62,000, but more is needed. Shobna, who has been a friend of Madison since she was first diagnosed with stomach cancer aged 10 months, sold hundreds of her own items. Shobna said: "Maddi needs these vital funds to continue her life saving treatment. She is a very brave girl who deserves a chance at life back home with her family in Darwen." Customers were treated to five-minute celebrity style consultations from glamour guru Armand Beasley, who has worked on Gok Wan’s How To Look Good Naked. And the day ended with a raffle of Coronation Street 50th anniversary memorabilia, including Stan and Hilda's flying ducks and limited edition prints of Deidre behind bars. Karen Turner is now qualified to represent Mitchell's Scaffolding as part of the construction industry.This new part of Karen's role should assist students leaving full time education make an informed decision about their career path. Her Knowledge of the trade and the skill's required will go a long way to gaining a clear understanding, should you want more details or would like to host a presentation at your school, college or group call Mitchell's on 01254 392100 and we will be happy to discuss things further. Simian Risk Management Limited is an occupational health and safety consultancy and training provider for the construction industry, specialising in access and work at height. Mitchells Scaffolding attend the The Chartered Institute of Building (CIOB) annual dinner event. The event was held at the lowery theatre, Salford Quays, greater manchster. Guest speaker was Rod Woodward, Winner of the "Encore Comedian of the year". Stuart and Sharon of Mitchells Scaffolding Ltd, Gary of Rosslee Construction Ltd, Dennis of ROK Group, John of Craig Hambling Ltd, Terry of Brammall Construction, Catherine, David and Jeff of Elevate East Lancashire/Regenerate Pennine Lancashire, Marcus of BAAS Construction Ltd and Ruckshana of Emanuel Whittaker Ltd.
Maddi's Magnificent Corrie Caper was organised to raise money for five-year-old cancer sufferer Madison Allan and her family to be able to enjoy a dream holiday at Disneyland Paris. Proceeds from Sunday's show went directly to the travel agents so the family can go away in June 2010. The soap stars appearing on stage included Andy Whyment (Kirk), Sam Aston(Chesney), Malcolm Hebden (Norris), Steve Huison (Eddie Windass), Debbie Rush(Anna Windass), Jenny McAlpine (Fizz), Kym Marsh (Michelle), Peter Armitage (Bill Webster), Graeme Hawley (John Stape), Jack Shepherd (David Platt), Scott Wright (Sam Kingston) and Chris Gascoyne (PeterBarlow). There was also a spot of stand-up from Jimmy Cricket, acomedy sketch from Sue Devaney, and opera from BBC Radio Lancashire's John Christos. Everything was held together in fine style by Ted Robbins and the evening raised nearly £4000. The show had been organised by Shobna Gulati, who plays Sunita in the soap, who has known Madison's family for several years and called on her fellow actors and behind-the-scenes staff for this special event. She came to Thwaites Empire Theatre, Blackburn, Lancashire with help from Anthony Valentine, the venue's patron. More photos of the show can now be seen viewed on Flickr pages. Thanks to Lancashire Telegraph for the above picture of the cast with Madison. Staurt Mitchell, Managing Director of Mitchells Scaffolding meets Chris Akabusi at local Lancashire Business Meeting. Mitchells Scaffolding arrange for local Accrington School pupil to help gain work experiene in the scaffolding trade for a 2 week placement. Mitchells Scaffolding Ltd would like to wish everyone a Happy Easter. Mitchells scaffolding ltd have been approved by burnley county council to carry out scaffold contracts throughout burnley in lancashire. Mitchell's Scaffolding transform wagon and staff into Peter Pan the movie, for the Acrington, lancashire Carnival. We have recently received Accreditation from SAFEContractor, a programme which recognises very high standards of health and safety practise amongst UK Contractors. SAFEContractor is operated by international safety, health and environmental risk management specialists, the National Britannia Group. The system is applicable to most sectors - but particularly users of contract services. Darren Hughes, Operations Director for SAFEContractor at National Britannia said, "Major organisations can no longer run the risk if employing contractors who are not able to prove that they have sound health and safety policies". "More companies need to understand the importance of adopting good risk management in the way that Mitchell's Scaffolding Ltd has done. The firm's high standard has set an example"
Under the SAFEContractor system, businesses undergo a vetting process, which examines health and safety procedures and their track record for safe practice. Companies meeting the required high standard are included on the database on the SAFEContractor Web Site. Mitchell Scaffolding Staff and friend dress up as famous cartoon characters which were ll designed and sewn by Mitchells very own New business executive Karen Turner. Mitchell’s celebrated their success with style. Mitchell’s Scaffolding is based on quality and service. Both Stuart and Sharon understand that team work is the key. The staff have worked hard to achieve this level of recognition and we are proud of their accomplishments. To ensure that this level continues Mitchell’s works with training providers across the Northwest ensuring their staff get the best training. All Mitchell’s staff are given the opportunity to undergo training, increasing their skills and knowledge that will further represent the company. The training is sourced and funded by Mitchell's whether H. G. V. or Apprenticeships. From the outset Stuart wanted a company that created loyalty from its workforce and respect from other company’s within the construction industry. This has clearly been achieved and this award is an indication of what can be achieved. The Trophy and certificate now take pride of place. The Mayor of Blackburn, Lancashire presented Mitchell’s scaffolding and Darwen Youth Group with 2nd prize for their entry in this year’s darwen Gala. 22 entrants vied for the coveted first place. Mitchell's with their first ever entry themed around Hollywood movie stars past and present worked hard to put this together. The Youth Group based at Darwen Vale High School, Lancashire meet every Wednesday, to learn the techniques for screen acting with Scott Wright of Coronation Street, Manchester fame heading the Group. Mitchell’s had the opportunity to support the group according to Spokes person Karen Turner and became involved thanks to Granddaughter Ashley Turner’s involvement with the group. Business Executive, Karen Turner, pictured being presented with the award . Karen said “the day was a great success and being awarded second prize was the icing on the cake” the youth group and Mitchell's worked very hard to put together the float. Christine Hargreaves, family member and friend, said they were only able to begin dressing the wagon that morning. And due to the distance had to take the vehicle to the start up point before they could begin but the end result had been worth the effort. scaffolders in blackburn, scaffolders in burnley, scaffolders in chorley, scaffolders in preston, scaffolders in liverpool, scaffolders in oswaldtwistle, scaffolders in great harwood, scaffolders in lancashire, scaffolders in darwen, scaffolders in pendle, scaffolders in haslingden, scaffolders in manchester, scaffolders in simmonstone, scaffolders in barnoldswick, scaffolders in sabden, scaffolders in whalley, scaffolders in nelson, scaffolders in colne, scaffolders in accrington, scaffolders in north west, scaffolders in blackburn, scaffolders blackburn, scaffolders in haslingden, scaffolders in rochdale, scaffolders in rossendale, scaffolders in hapton, scaffolders in todmerdonm, scaffolders in uk, scaffolders in bury, scaffolders in cumbria, scaffolders in clitheroe, scaffolders in mellor, scaffolders in bb1, scaffolders in bb2, scaffolders in blackburn lancashire, scaffolders in blackburn town centre, scaffolders near blackburn.